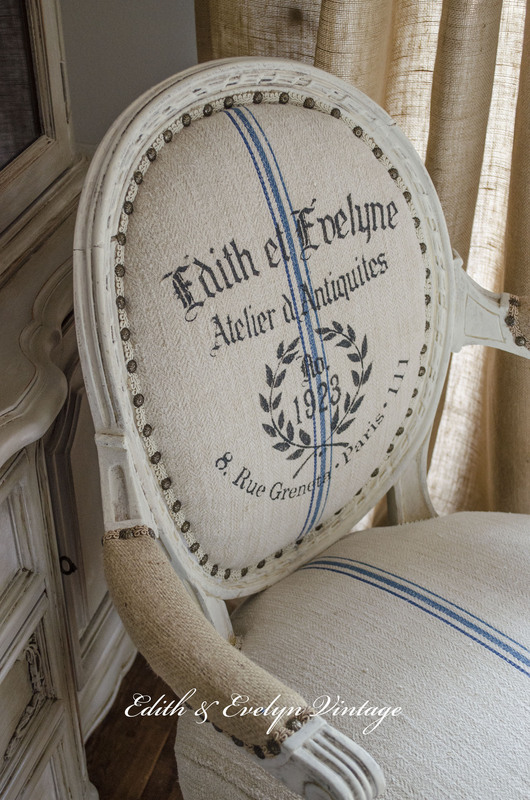 Ya’ll know of my love for French chairs and grain sacks. 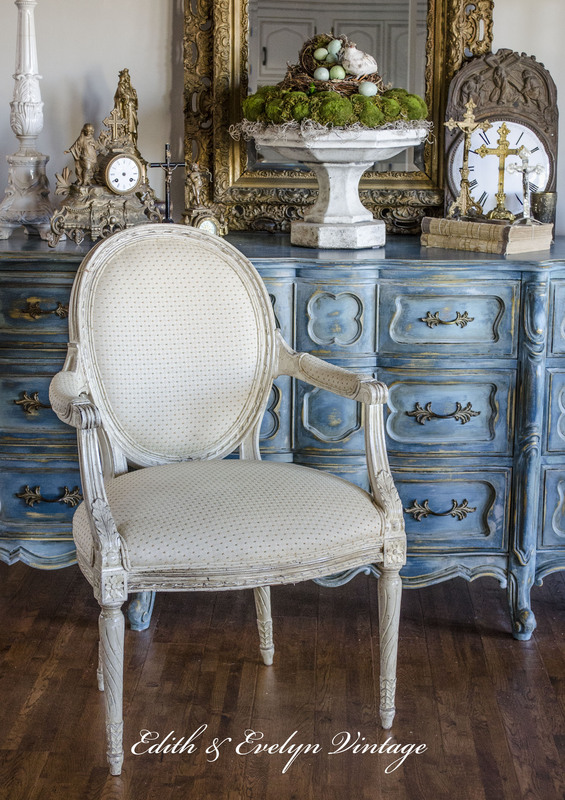 Whenever I find a frenchy chair at a good price and in good condition, I have a hard time walking away from it, which has resulted in having several that are in need of updating. 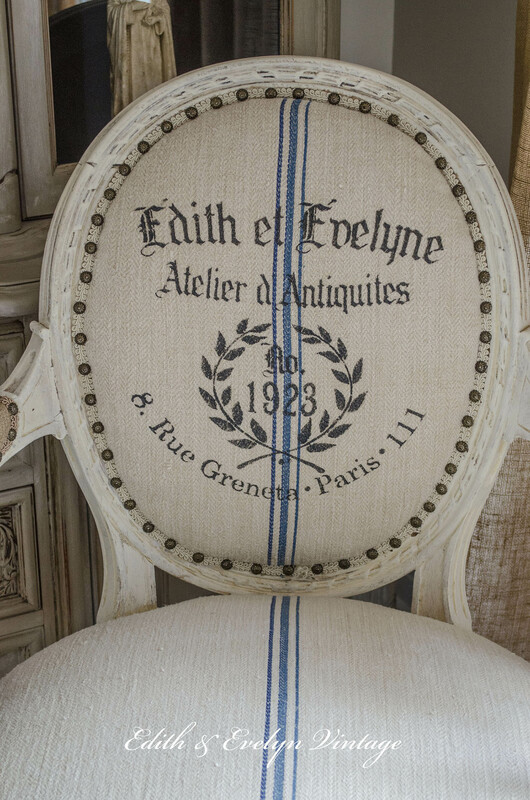 If you’ve been following along, you’ve seen my French dining chairs that we “renovated” with grain sacks and stencils. Well, I’ve been needing a new chair for my home office and I had one in storage that I had picked up at an estate sale for $38.00. 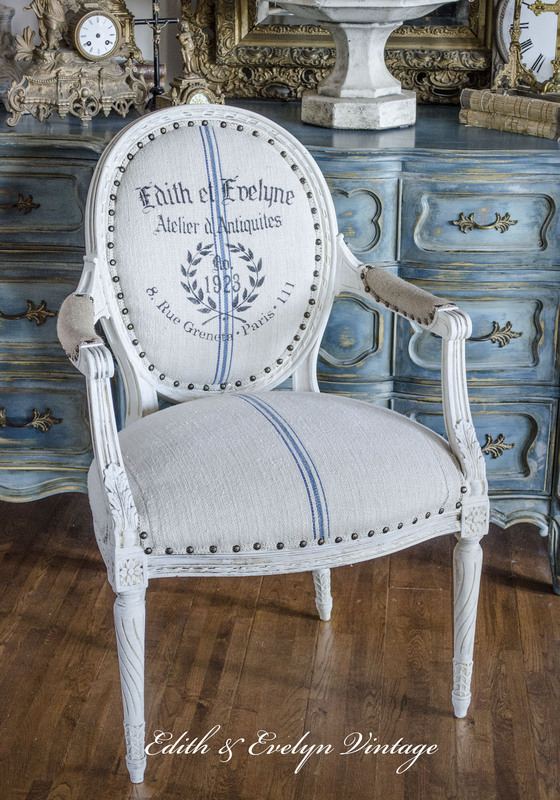 I wanted to personalize this chair in a special way and I knew that Lisa at Maison de Stencils could create a perfect, one of a kind, stencil for me. So I told her what I was wanting, and she created exactly what I had envisioned! Here is what the chair looked like when I purchased it. And here is what she looks like after her makeover! I am absolutely in love with the way this chair turned out! I didn’t have to do much to the frame because it was already painted in a light color. However it had a slight yellowed look to it. I didn’t want to lose any of the natural distressing that had already occurred, so I just watered down some ASCP chalk paint in Old White and whitewashed it. The piece de resistance of this chair is the stencil design. I have used stencils from Maison de Stencils for a few years and the excellent quality has enabled me to use them over and over again for several projects. They just don’t wear out! For this project, I wanted something special, meaningful to me, something that represents Edith & Evelyn, the two special ladies that this blog and my business are named after. 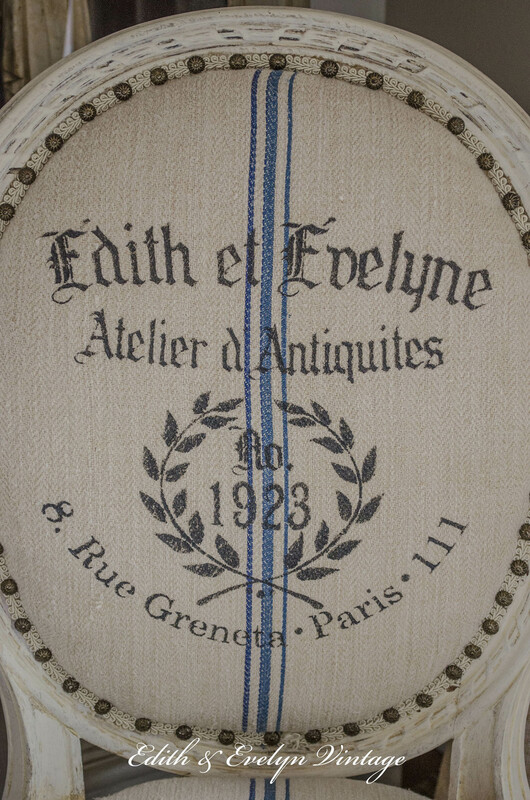 Lisa with Maison de Stencils did an amazing job capturing what I wanted, using the French versions of Edith & Evelyn, and including the year of their births. I couldn’t be happier! I had the perfect grain sack with the most perfect, triple blue, stripe to use for the seat and back. 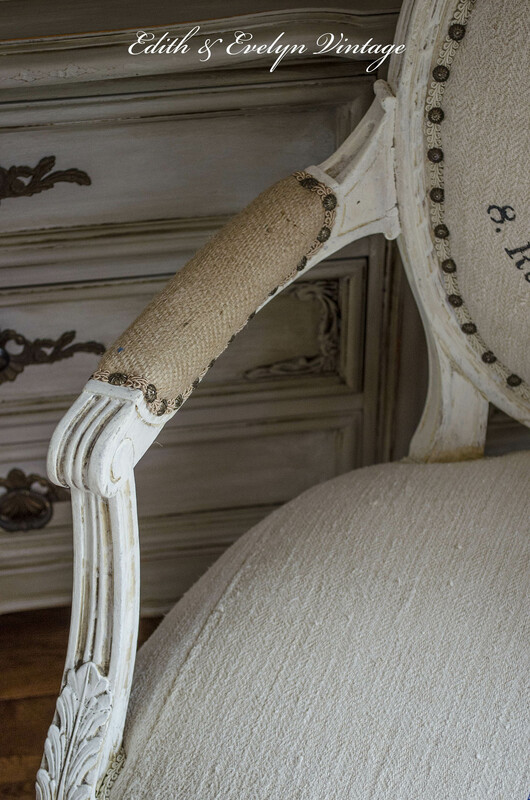 On the arms and on the back side I used upholstery grade burlap to give the chair some texture. And the finishing touch was the nailhead trim. The seat of this chair was nice and wide so I actually had to split the grain sack down the middle, in the back, in order to get the stripe where I wanted it. This gave the chair a few unique characteristics such as the grain sack seams showing on both sides and also an old repair to the sack. Now some of you may not be so crazy about these little characteristics showing, however I love them. For me, they just add to the “story”. I can just imagine some farmer’s wife, long ago, sitting down to mend this grain sack. I’m so thrilled with the way this chair turned out. 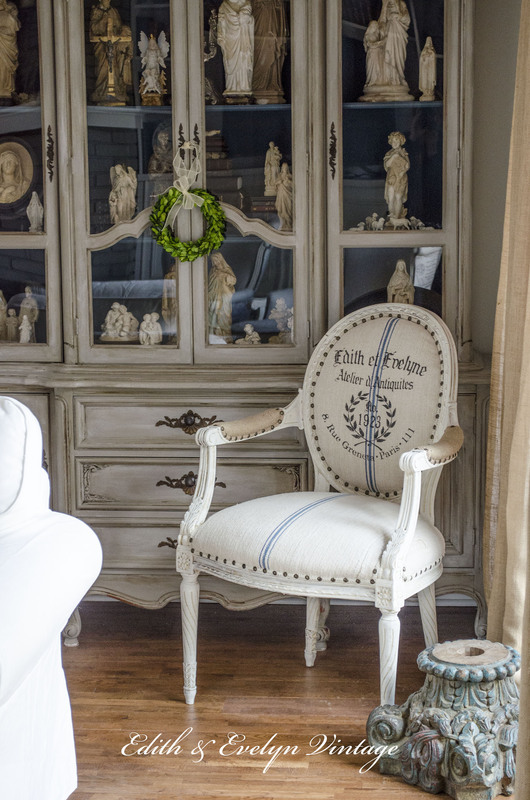 And thanks to Maison de Stencils, this chair will always hold a special place in our home. I can’t wait to get my home office renovated so this chair can sit behind the desk! 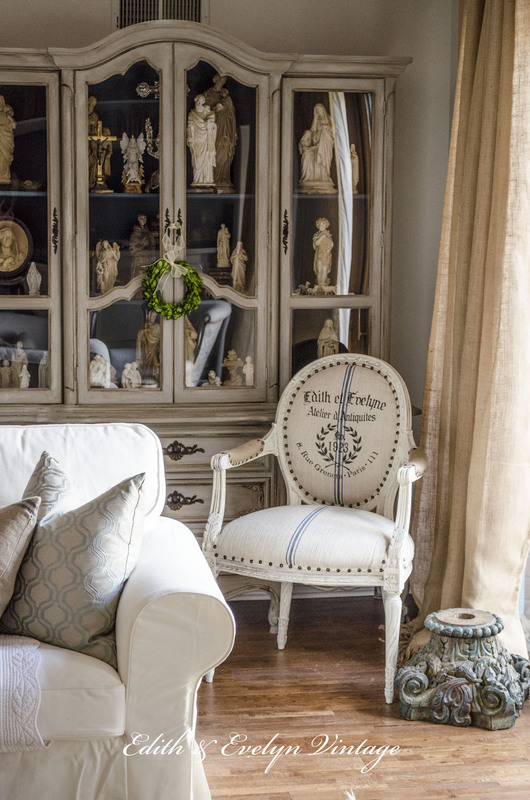 Part of creating your home is adding layers and pieces that reflect who you are. This custom stencil was the perfect way to tell a piece of our story, and it created a special, treasured, piece at the same time. 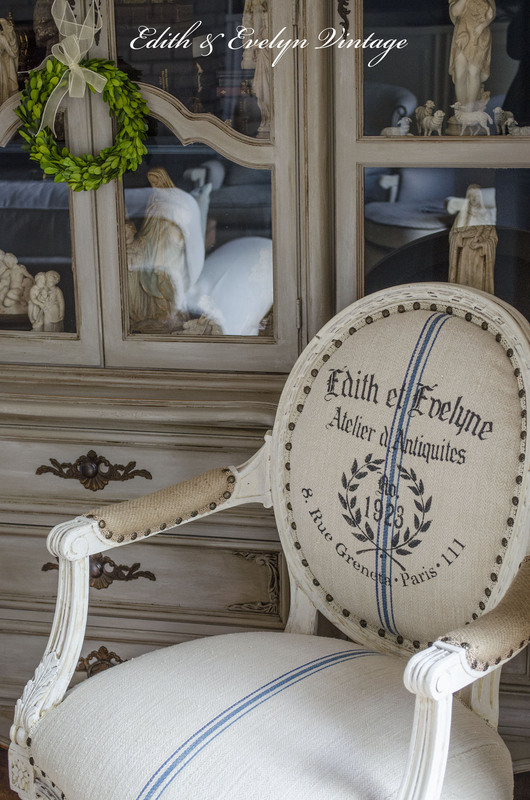 Maison de Stencils offers a wide variety of European and vintage inspired stencils for just about any project imaginable. Or if you have something custom in mind, they can do it! 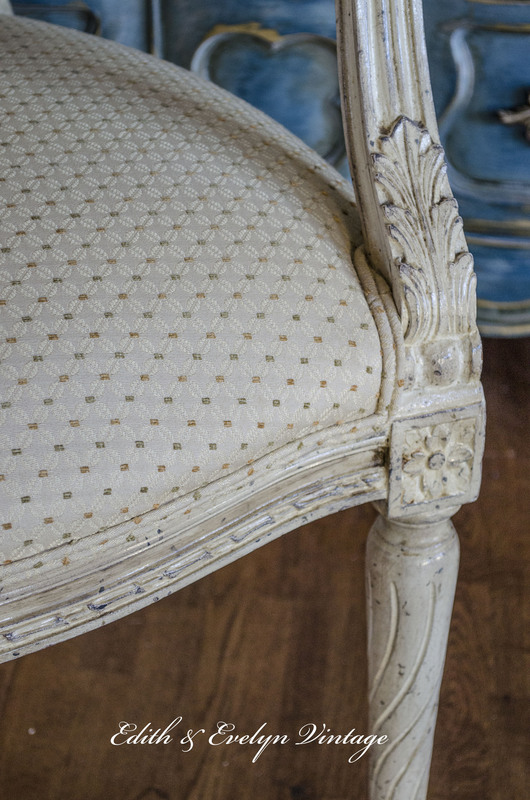 Slowly, but surely, my stash of french chairs are getting their makeovers! Please note: The stencil was provided by Maison de Stencils, however all opinions are my own. Even though this post is from over 3 years ago the picture of your beautiful chair just popped up in my Pinterest feed. Can you please share with me what product you used to create the stencil? Is it ink or paint or something else? Hi Jodell! I used fabric paint from Hobby Lobby to paint the stencil. The stencil is from Maison de Stencils. Www. Maisondestencils.com I hope that helps! The chair is absolutely gorgeous. I would love it if you would share this fabulous post at our WIW Linky Party. Hope you can join us! Thank you Paula! Just posted on your fabulous WIW Linky Party!! What an absolutely beautiful chair, it’s simply elegant! I’m in love with this chair! Thank you for listing in the Bloggertunities share list. I’ll be sharing it on my blog today. Gorgeous! I love everything about this chair! Hi Cindy, what an amazing chair, the stencil just kicks it up a notch! love it. I just pinned it, and thinking about a personalized stencil myself. Thank you Debra! You should definitely get a personalized stencil! Maison de Stencils is so easy to work with and the quality is amazing. I have reused their stencils over and over again. Thank you for pinning the chair! That chair is perfection, I love it! This is lovely you did a beautiful job! 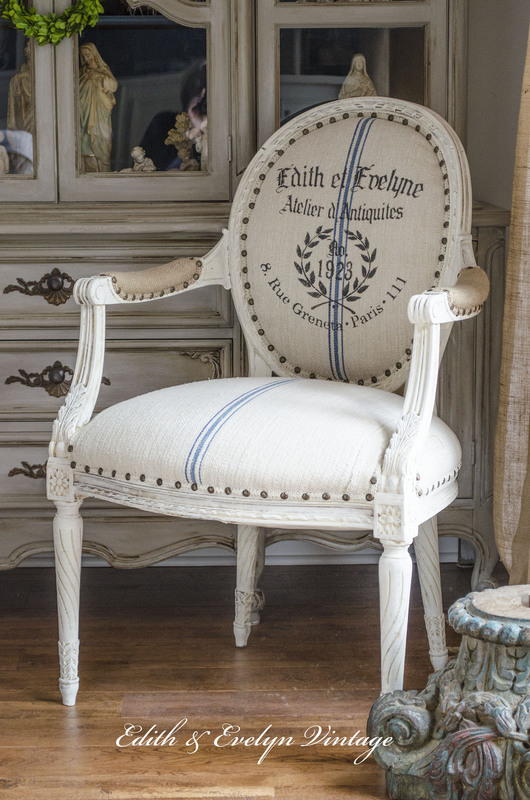 Oh thank you for the resource of Maison de Stencils and for showing us your amazing chair! 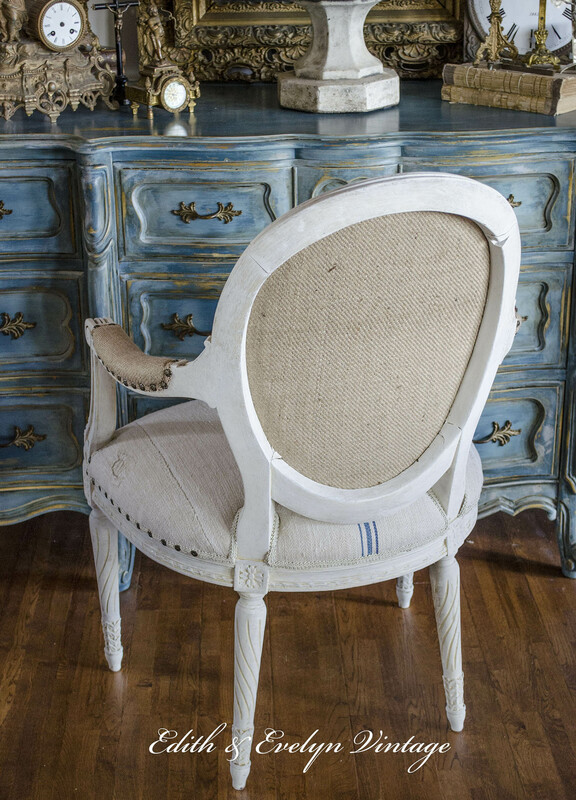 On a side note, I’ve noticed several touches of gorgeous blue in your posts: in this post, the lovely stripe in the grain sack, and I think a hint a blue peeking out from the interior of the blonde distressed china cabinet and the oh-be-still-my-heart blue buffet at the top of this post. Can you PLEEZ tell me (us) how that blue came to be? Did you paint and layer and distress that buffet yourself? And what color is this blue on the buffet? Oh how lovely it is and I need to do this to a piece in my home. Thank you! And I love your blog. Keep it coming, I say! I would love to do another piece like this! You are so clever! 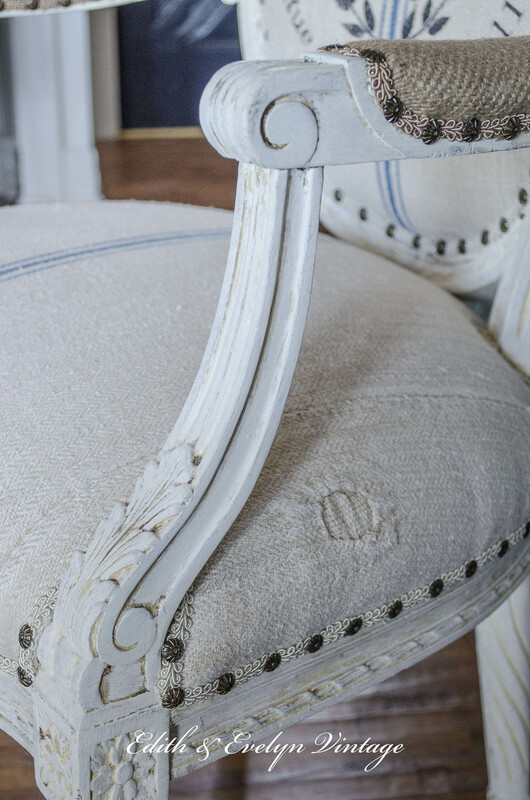 Maison de Stencils did such a wonderful job and your chair is beautiful! love it! Oh my goodness, just gorgeous! ANOTHER beautiful chair. I love the stencil, its so sweet. I am inspired to create! Thank You! Cindy – You did such an amazing job on that chair. I love the stencil they made – they are so good! And it makes your chair so personal for you. OMG, Cindy I love it!! Such a cool idea getting that custom stencil. Love the make over of that chair. I really like the stencil, that just made it more precious. That chair is gorgeous, what character, looks like it came with lots of stories to tell. Your chair transformation is beautiful. What a beautiful and meaningful custom stencil! Wish I could transform a chair like that! Wow it turned out gorgeous! Beautiful, Cindy! The stencil is perfect. Cindy, you are a very talented lady! Love the chair and I love the drapes in this room also and wandering if you made those and if so what fabric are they? Thank you Debra! The drapes are actually the fringed burlap drapes from Ballard Designs. That chair is so beautiful! I just adore it. 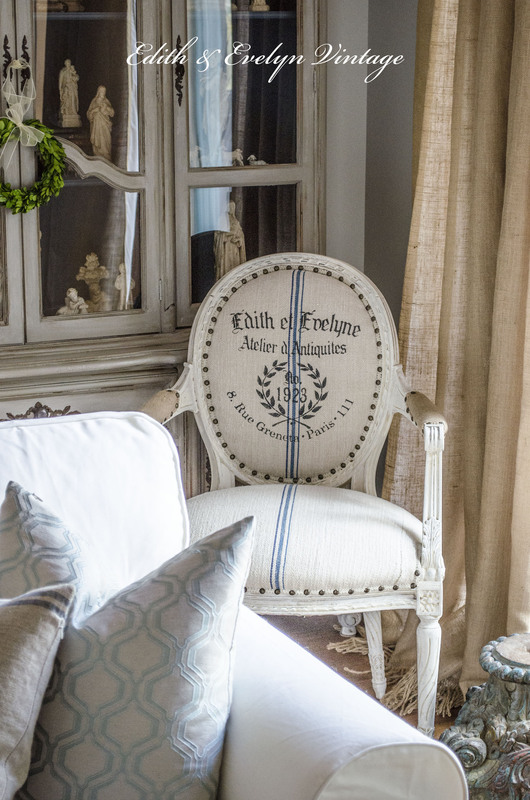 What a most gorgeous chair…the stencil is exquisite…and how so very special….and must say that I do love the little characteristics and Maison de Stencils did magnificent job on the stencil…What a most special chair.